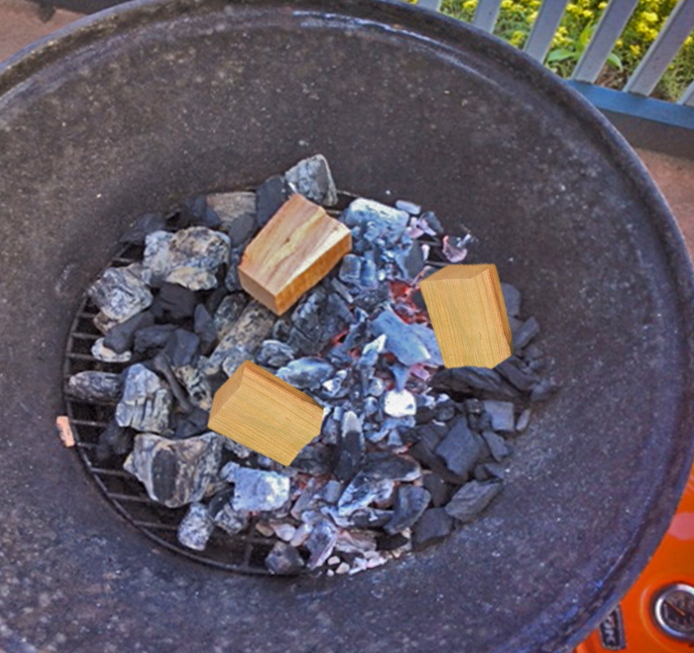 Adding wood chunks will turn your charcoal grill into a Smoker to produce tasty results. Let’s be honest. When you bought that charcoal grill you were likely thinking that you could both grill and smoke without needing to add anything. Soon, you realized, that just wasn’t the case. Now, you’re contemplating whether you need to purchase a smoker. Well, hold on the shopping trip until you read this. You can turn your charcoal grill into a smoker with these simple steps! Obviously, if you own a little tailgate model of a charcoal grill, you won’t be doing multiple slabs of ribs or a full packer cut brisket on that unit. But you can smoke on any charcoal grill if you follow some simple steps and afford yourself enough time to do it right. Essentially, when you smoke on a charcoal grill you are roasting outdoors as you do in your conventional oven. If you use a good quality hardwood charcoal, you will get some flavor from that product but not like true smoked foods you may have experienced in your favorite barbecue restaurant. That bolder smokey flavor only comes from hardwoods. There are three primary fuel types you can use in your charcoal grill: briquettes with instant lite, briquettes, and lump hardwood charcoal. Right off the bat, I’m going to tell you to eliminate the briquettes with instant lite. That is a product that contains an accelerant or petroleum product to make it quick lighting. Unfortunately, it adds a very distinct, unpleasant component to the cooking process that can transfer off-flavors to your foods. Stick with plain briquettes or lump hardwood charcoal. Just note, that you likely will find a bit more ash developing faster with lump hardwood charcoals than you would with briquettes. Picking the wood for smoke flavor has a few rules you should adhere to: only use hardwoods, try to limit the bark on the wood or go bark-free for the best temperature control, find woods that have some measurable moisture level so they smolder – around the 20% level is ideal, and use chunks of wood versus chips. What truly makes for barbecue and not just grilling is using the indirect method of cooking. There are many ways to set up a two-zone cooking method which is also referred to as indirect cooking. Often, what you are cooking and the quantity will determine the setup of the fuel. There are two popular methods that work the best: banking the charcoal to one side of the unit with the food going on the unlit side and putting the charcoal on each side of the unit with the food going in the middle where no charcoal is present. For those that need a bit more help keeping everything where it’s supposed to go, there is an accessory called the Slow ‘N Sear that works well with kettle grills and includes a trough that holds water. This allows you to place foods on the upper Grates as well as below on the opposite side of the charcoal. It certainly will give you ample room to cook many pounds of meat. To ensure that any protein cooked on the grill remains moist and tender, include a water pan in your set up. This is easily done by purchasing readily available disposable foil pans from the discount store. The shape and size will be dependent on your actual grill. I like to add warm water to the water pan so the grill does not have to exert energy to heat up the water, which takes heat away from the unit. Remember, the water will be evaporating during the cooking process so have additional water available if it depletes before the cooking is complete. Water pans are set in the base of the unit on the charcoal free side, directly under the food. This will also act as a drip pan, catching all those juices as well. Once you have your charcoal set up, the water pan laying in the charcoal free section, it’s time to light the charcoal. The easiest way to do this and ensure that the grill gets hot pretty fast is to light a chimney starter. These are portable containers made of metal that allow you to pour a couple of pounds of charcoal into and light from vent openings at the base. Usually, these devices require you to place a newspaper at the base which is then lit with a lighter to ignite the cold charcoal. I skip the newspaper step and simply use a MAP gas canister with easy operating torch head to light the charcoal. The best part is I can leave the torch under the chimney starter on a safe surface such as concrete, while I finish the grill set up. Once the charcoal at the bottom of the chimney starter is lit, I remove the torch and allow it to burn up through the rest of the charcoal. Once the pieces are grayed over and showing hot embers, it’s ready to pour into the grill’s charcoal area. I carefully pour the hot coals on top of the unlit coals. This will ensure plenty of fuel during the cooking process. Next, 3-4 smoker wood chunks are placed on the hot coal area. I usually disperse these with a couple of inches between pieces. With the grill set up complete, the hot coals going and the smoker wood chunks beginning to smolder, it’s time for the meat. Always take the prepared meat directly from the refrigerator to the grill COLD! Cold foods will attract smoke vapor faster, allowing the vapor to condense on the food’s surface. The water pan will ensure that moisture remains within the grill which also will ensure attraction of the smoke vapor. Vent Settings Guarantee Temperature Control! Although charcoal as a fuel also aides in temperature control, I’m going to speak about air control. To sustain fire or combustion, you need oxygen flowing into the grill, stimulating the hot coals. This is the intake damper. Close it completely, and you’ll put the fire out and lose all temperature. Open it wide and you’ll increase the temperature as the coals get stimulated for more heat. On the opposing end is the exhaust damper also called a vent or flue/chimney. This vent is what pulls in the oxygen through the lower intake damper. Yes, smoke is expelled through the exhaust vent but heat, as well as the gases that are derived from the combustion of the fuel material including the hardwood smoker chunks, are also vented. The exhaust vent needs to be partially open all the time. If the temperature starts to fall, open the intake damper wider. If the temperature is too high, reduce the oxygen to the fire by closing the intake damper. Now, make your shopping list for your favorite foods to smoke and set up that charcoal grill for a fabulous flavorful day. It’s really that simple! Did we get you motivated by this article and want to turn your Charcoal grill into a Smoker? If so, leave a comment as we’d love to hear from you. Don’t forget to let us know what other questions you have, as we always design our postings after the needs of our followers. As always, subscribe and follow us, so you don’t miss a thing! Is Heartwood Really The ‘Heart’ Of The Tree? Dr. Smoke on how to turn your charcoal grill into a smoker! Can you please tell me about which kind of thermometer perfect for it? Any meat thermometer will work! Thanks for share a Great article. I enjoyed this article. Very Helpful for me.